Today EFFORT Racing, with the support of Porsche Motorsport North America, announced the Pirelli World Challenge sports car racing team will take a hiatus from 2016 competition, with every intention to continue the program in 2017. The decision stems from the current supply and demand crisis in the oil industry, an industry from which EFFORT Racing receives funding to run the championship. In a recent analysis, the New York Times estimated the current trends of oil prices is in its worst decline since the 1990s. Although the current price of $45 a barrel is an improvement from earlier this year, it remains a far cry from what has been the normal price of $100 a barrel. While oil companies have been making cutbacks for months, the Chicago based team has decided to suspend their 2016 campaign and focus on building sponsorship to fund the program for the 2017 championship. The team’s conclusion to step back from the series came at a difficult time, with drivers Michael Lewis and Patrick Long currently sitting fourth and fifth in an immensely tight battle for the GT Driver Championship, and the team presently third in the GT Team Championship. Long won the opening round at Circuit of the Americas, and again made the podium at Round five’s Long Beach Grand Prix. The crew made headlines after Circuit of the Americas when a heroic 200 man hour effort was required to repair Long’s heavily damaged Porsche 911 GT3 R in between Round 2 and 3 of the championship. At the Grand Prix of St. Petersburg, Lewis, currently in Porsche Motorsport’s Young Driver Development Program, earned back to back wins, his career-first GT wins. 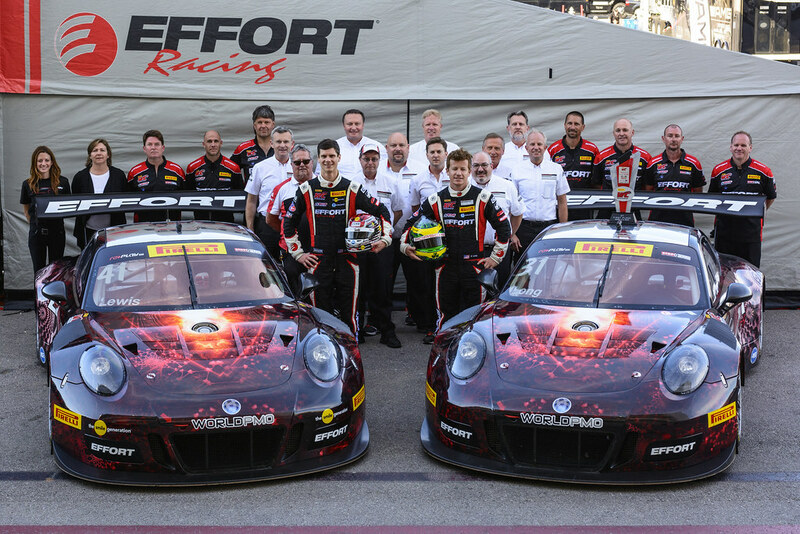 Although not competing, EFFORT Racing will continue its long standing relationship with Porsche as the team continues to have conversations about a sponsorship program. While there are potential opportunities on the horizon, none could come to fruition quick enough for Rounds 8 and 9 at Canadian Tire Motorsport Park later this month. Instead, the team will put all its focus on 2017 and remains optimistic a program will be secured for 2017.